Explanation: It was just eight minutes after sunrise, last week, and already there were four things in front of the Sun. The largest and most notable was Earth's Moon, obscuring a big chunk of the Sun's lower limb as it moved across the solar disk, as viewed from Fremantle, Australia. 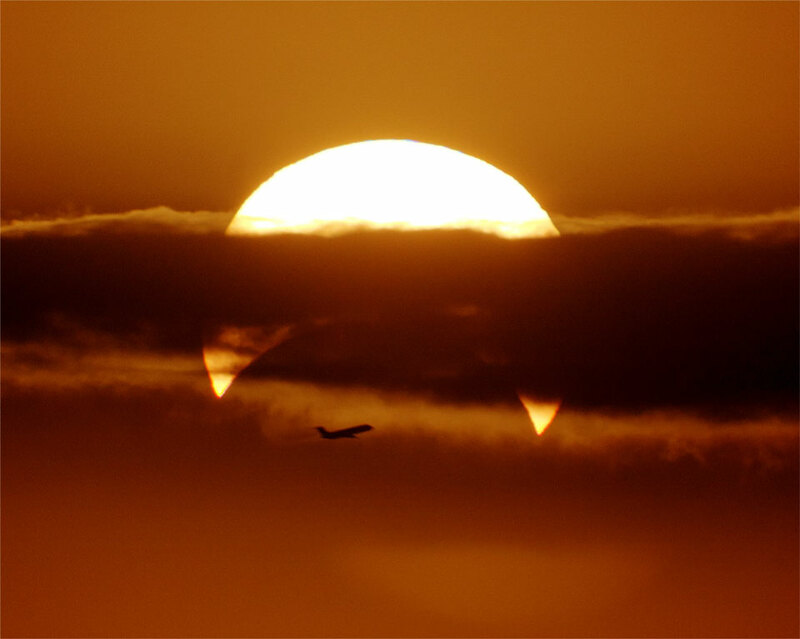 This was expected as the image was taken during a partial solar eclipse -- an eclipse that left sunlight streaming around all sides of the Moon from some locations. Next, a band of clouds divided the Sun horizontally while showing interesting internal structure vertically. The third intervening body might be considered to be the Earth's atmosphere, as it dimmed the Sun from its higher altitude brightness while density fluctuations caused the Sun's edges to appear to shimmer. Although closest to the photographer, the least expected solar occulter was an airplane. Quite possibly, passengers on both sides of that airplane were contemplating the unusual view only visible out the eastern-facing windows.